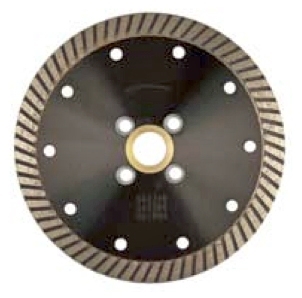 This fast cutting blade has a quad-hold flush pattern for use with stone saws on all sizes except 8". 4" /102 10 7/8 - 5/8"
4.5" /115 10 7/8 - 5/8"
5" /125 10 7/8 - 5/8"
5.25" /131 10 7/8 - 5/8"
6" /155 10 7/8 - 5/8"
*Quad flush holes not on 8" blades. DX - Turbo - 10 Pack 4.5" up to 7" Rambo 12" up to 18" DB Fury Segmented Curve 4.5" & 5" 360 PT 12" up to 20"